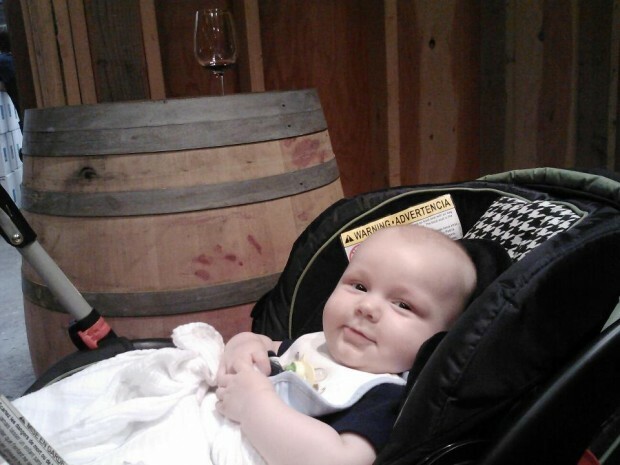 Babies at wine tastings? Yes please! Since having my son four months ago I’ve made a point of not letting the little guy slow me down. That doesn’t mean I haven’t spent time at home cuddling, playing and enjoying these early months where he thinks his mom and dad are the coolest people around (I know this won’t last forever), but when the chance arises to get out of the house for something fun, I typically won’t turn down the invitation. That was the case Labor Day weekend. My best friend Michelle flew all the way from Maui to meet the little guy, and of course hang out with her bestie of 16 years. Not wanting to deal with the Seattle craziness, we opted to stay in Kitsap. Instead of hanging around our house all weekend I suggested we head to Bainbridge Island to take advantage of the winemaker open houses and try some wine. Since Daddy worked Saturday, there was no leaving the baby at home. So we packed up the little guy and hit the dusty trail. We had so much fun we returned Sunday, this time with Daddy in tow. The baby handled his first wine tasting like a pro, hardly making any fuss, and the wines we tried were superb. (As you can see below, he enjoyed his time at Eleven Winery Saturday). I know we just devoted several weeks of our “What we’re drinking” posts to the Bainbridge wineries, but there were some new releases this weekend that were too good not to mention. Rolling Bay Winery’s 2011 Fusion. This wine is a blend of 75 percent chardonnay, 25 percent pinot gris. Winemaker Alphonse de Klerk sources all of the grapes for his wines from Snipes Mountain in Eastern Washington. This white blend is fermented and aged in stainless steel tanks, which allows the mingling of citrus and tart fruit flavors of the chardonnay and pinot gris to stand out. The winery showcased its Fusion white wine blend in 2007 and de Klerk has made it ever since, thanks to its popularity among his winery’s followers. It was a great wine to start our tasting with Saturday, and paired nicely with the mini cubes of white aged cheddar we sampled. Eleven Winery had a couple of wines that stuck with us after we left. While we enjoyed everything we tasted, we especially liked the 2011 La Primavera, a rosé, and the 2011 Angelica, a white port made from pinot grigio. The Primavera was wonderful — made just the way I like it: dry. Winemaker Matt Albee blends all of the red grapes he sources for his other wines to make this delightfully light rosé. The Angelica port was a great surprise too. It’s not everyday you see a white port; most well-known ports are made from red grapes, but there is such thing as white port wine. This wine offered a delicate balance between the citrus flavors of the pinot grigio grapes and sweetness. Eagle Harbor Wine Company’s 2009 Viognier. Winemaker Hugh Remash doesn’t offer this wine as a part of his five wines available for tasting, but we lucked out Sunday. Remash described the wine to us, saying he doesn’t filter or fine the wine, so it appears cloudy because of the sediment that stays in the bottle. This can be unappealing to some, which is one reason why Remash doesn’t taste people on it. As Michelle debated whether she wanted to buy a wine she hadn’t tried, Remash went into the back and brought out a bottle of his precious viognier. Saying he planned to open some for dinner guests that night anyway, Remash poured us a sip. Oh my what a treat. This was hands down my favorite white wine we tried at his winery Sunday — Remash’s Goldfinch sits high on my list of favorite wines, so this is an impressive feat. The viognier grapes come from Remash’s block at Dwelly Vineyard in Walla Walla. While Remash warned the wine might be cloudy, it poured nicely. Floral and tropical notes filled our noses and then our mouths. The full mouthfeel of the wine was exactly what I love about oaked white wines, but by no means does oak overpower this wine — it adds weight, but doesn’t detract from the delicate characteristics of the viognier grape. Amelia Wynn Winery’s 2011 Riesling is the wine I ended with Sunday while at the Island Vintners tasting room in Winslow. Since we got a late start on the day, 5 p.m. came upon us fast — that’s when the wineries close their doors to tasters. So we headed to the tasting room, which was open later. We ran through the list of Amelia Wynn winemaker Paul Bianchi’s white wines, including his chardonnay, sauvignon blanc and Riesling. Bianchi added all of these this year after seeing the high demand for white wines from visitors to the tasting room. The 2011 Riesling was just released. It’s a refreshing wine, and a perfect match for some of the warmer afternoons we’ve been having recently. The color is a pale, barely visible yellow, and the slight sweetness of the grape is met with the balance of tart citrus flavors, leaving your mouth feeling refreshed sip after sip.